Our expertise in the industry has supported us in the fabrication of qualitative range of De Awners. We have modern infrastructure and experienced professionals to offer these not only in standard size but also as per the requirements of diverse industries. Our customers can avail our range according to their industry centric requirements. Optimal performance in the grain treatment process. Cimbria DELTA De-awners are specifically designed for treatment of malting barley, seed grain and all other seed varieties. 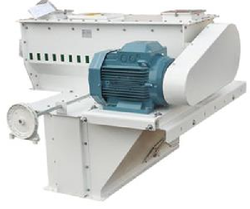 Cimbria De-awners are employed mainly for de-awning of barley, breaking clusters of beet seed and for surface polishing of grains and vegetable seeds thereby improving the appearance and increasing the bushel weight. The inclusion of a De-awner with its cluster breaking action will greatly improve the performance of subsequent machines in the cleaning system. The de-awning process is usually carried out before cleaning based upon the quality and type of grain or seed and the required quality of the finished product. The best position for such a machine should be determined after consultation with our engineers prior to installation. Looking for De Awners ?